Fluke is voluntarily recalling its 190 Series ScopeMeter® 100MHz and 200MHz 4 Channel Hand Held Oscilloscopes that contain firmware version V10.40. This includes all units manufactured between February 5, 2012 and April 3rd 2012 and have a serial number range of 1954xxxx to 2009xxxx, and all units upgraded to firmware version V10.40 after February 5, 2012. The affected models numbers are listed in the table below. You can determine whether your 4-channel ScopeMeter® is being recalled by checking the firmware version as described below. Stop using it until after that determination is made. This recall does not include the 2 channel ScopeMeter® units. To determine whether your ScopeMeter® is being recalled, first check the firmware version of the product by following these steps: (1) Disconnect the ScopeMeter® from any signal source; (2) with the unit turned on and facing you, press the user key located at the bottom right side of the instrument's front panel; (3) press F3 (Version and Cal). 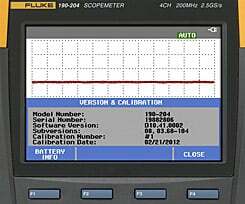 Stop using the Fluke 4 channel ScopeMeter® even if you have not experienced problems. Verify your 4 channel ScopeMeter® is affected by this recall using the steps above. You can return your ScopeMeter® by submitting an online service request or calling (888) 97FLUKE (35853), 7 a.m. to 4 p.m. US Pacific Time Monday–Friday. Follow the instructions provided and we will send you a prepaid mailer to return your unit at no cost. If you are located outside the US, contact your local authorized service center.